2 Prepare for approval by the Govenors budget plans to include staffing structure reviews, in accordance with recognised accounting standards and practices and UTC development priorities. Ensure the UTC achieves value for money in all areas. Provide management accounts to SLT (monthly) and to appropriate Governors meetings throughout the year. Advise the Principal and the Governing Body of the financial consequences of decision and options open to them. Ensure the operation of effective purchasing and procurement systems across the UTC achieve value for money in all areas. Ensure the safe custody of all cash and bank balances held by the UTC. Liaise with the appropriate UTC personnel and appropriate outside agencies over the preparation of tenders for supplies and service contracts (including energy and utilities) ensuring compliance with standing orders and advising on financial consequences. Use financial management information, including benchmarking, to analyse trends and identify opportunities for greater efficiency. Negotiate, manage and monitor contracts/leases ensuring best value at all times for the provision of support serves e.g. cleaning, photocopying. Ensure leases taken out by UTC to ensure Value for Money are compliant with accounting/efa regulations. Liaise with professional bankers, insurance brokers etc and from time to time arranging their market testing. Identify and apply for additional funding/sponsorship and prepare bids as appropriate. Creatively write bids or assist others with the bid process. Maximise income generation within the ethos of the UTC. Assist with marketing plan and activities. Implement approved insurances and handle claims. Work strategically and develop creative proposals for improving services effectively. Keep up to date concerning funding matters and own professional development. Authorisation of salary changes general oversight of payroll function. 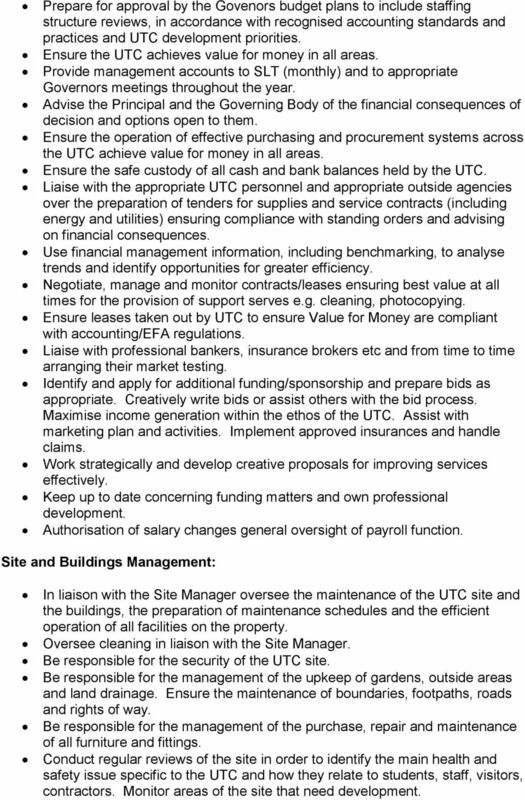 Site and Buildings Management: In liaison with the Site Manager oversee the maintenance of the UTC site and the buildings, the preparation of maintenance schedules and the efficient operation of all facilities on the property. Oversee cleaning in liaison with the Site Manager. Be responsible for the security of the UTC site. Be responsible for the management of the upkeep of gardens, outside areas and land drainage. Ensure the maintenance of boundaries, footpaths, roads and rights of way. Be responsible for the management of the purchase, repair and maintenance of all furniture and fittings. Conduct regular reviews of the site in order to identify the main health and safety issue specific to the UTC and how they relate to students, staff, visitors, contractors. Monitor areas of the site that need development. 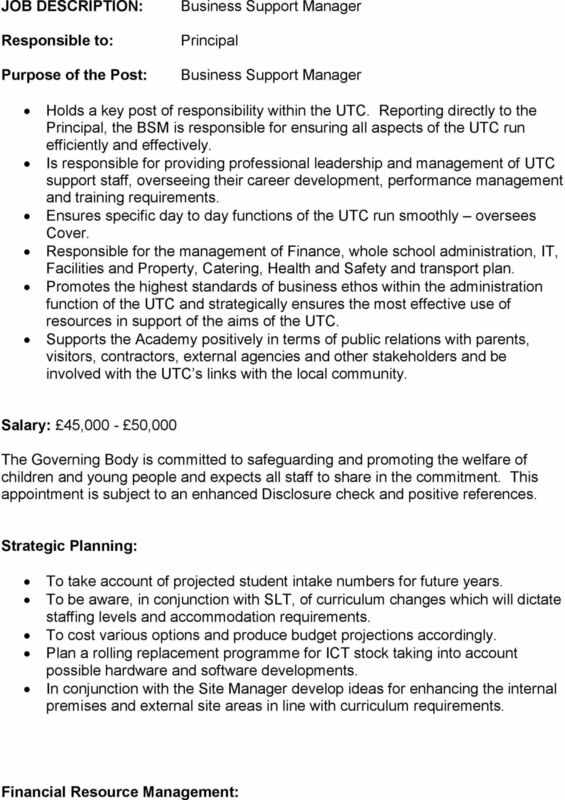 3 Be responsible for overseeing the work of the Site Manager with regard to letting of the UTC premises to outside organisations and UTCs staff, and for the development of all UTC facilities for out-of-school use, with particular reference to the local community. Market and develop UTC facilities. Acquire and dispose of land and buildings, obtaining tenders, planning permission and liaison with building contractors. Monitor and maintain financial control of capital budgets and advise the Principal and Governing Body as appropriate manage issues arising. Manage the tender/contract renewal process. Liaise with external agencies/professional bodies as appropriate (e.g. Health and Safety Executive, Police). Lead on the formulation of the Asset Management Plan and oversee its implementation. Be part of the team looking at strategic vision of possible extensive new development of site. Out of hours contact for the caretakers. Marketing: Ensure that the UTC has a coordinated and resourced student recruitment strategy. Effective use of marketing resources. Maximise public relation opportunities. Ensure the website and social media are kept current and appropriate. Advertise staff vacancies. 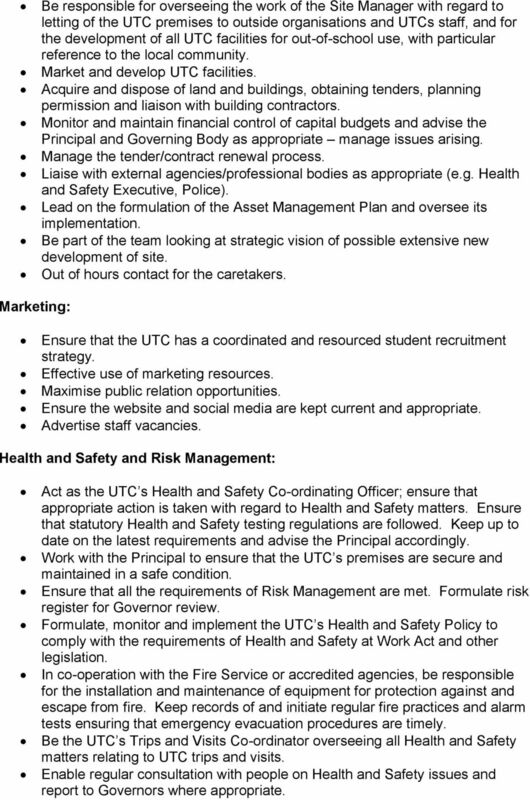 Health and Safety and Risk Management: Act as the UTC s Health and Safety Co-ordinating Officer; ensure that appropriate action is taken with regard to Health and Safety matters. Ensure that statutory Health and Safety testing regulations are followed. Keep up to date on the latest requirements and advise the Principal accordingly. Work with the Principal to ensure that the UTC s premises are secure and maintained in a safe condition. Ensure that all the requirements of Risk Management are met. Formulate risk register for Governor review. Formulate, monitor and implement the UTC s Health and Safety Policy to comply with the requirements of Health and Safety at Work Act and other legislation. In co-operation with the Fire Service or accredited agencies, be responsible for the installation and maintenance of equipment for protection against and escape from fire. Keep records of and initiate regular fire practices and alarm tests ensuring that emergency evacuation procedures are timely. Be the UTC s Trips and Visits Co-ordinator overseeing all Health and Safety matters relating to UTC trips and visits. Enable regular consultation with people on Health and Safety issues and report to Governors where appropriate. 4 Ensure systems are in place to enable the identification of hazards and risk assessment and that the Health and System Policy is implemented at all times and is regularly reviewed and updated. 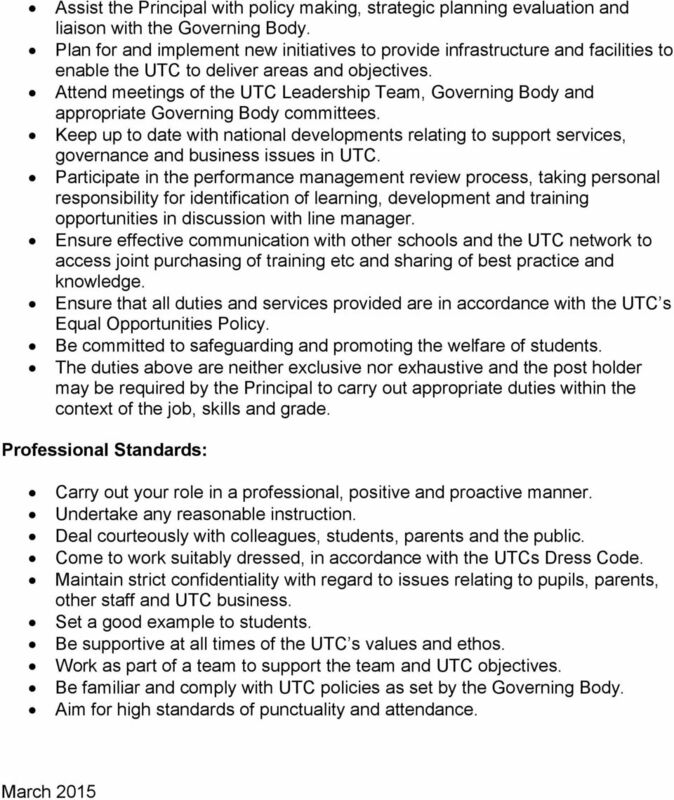 Catering: Liaison with the UTC s catering manager Responsibility for the UTC s catering system. Monitor the UTC s food offering to ensure it complies with the Healthy Schools Initiative. 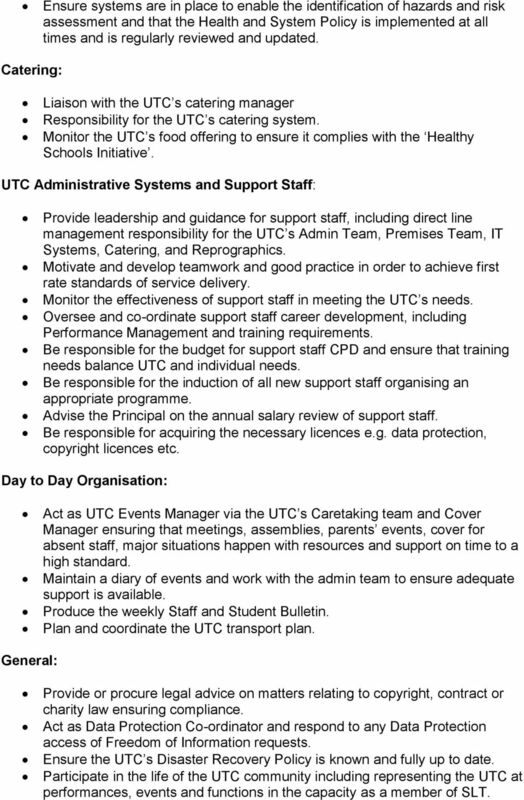 UTC Administrative Systems and Support Staff: Provide leadership and guidance for support staff, including direct line management responsibility for the UTC s Admin Team, Premises Team, IT Systems, Catering, and Reprographics. Motivate and develop teamwork and good practice in order to achieve first rate standards of service delivery. Monitor the effectiveness of support staff in meeting the UTC s needs. Oversee and co-ordinate support staff career development, including Performance Management and training requirements. Be responsible for the budget for support staff CPD and ensure that training needs balance UTC and individual needs. Be responsible for the induction of all new support staff organising an appropriate programme. Advise the Principal on the annual salary review of support staff. Be responsible for acquiring the necessary licences e.g. data protection, copyright licences etc. Day to Day Organisation: Act as UTC Events Manager via the UTC s Caretaking team and Cover Manager ensuring that meetings, assemblies, parents events, cover for absent staff, major situations happen with resources and support on time to a high standard. Maintain a diary of events and work with the admin team to ensure adequate support is available. Produce the weekly Staff and Student Bulletin. Plan and coordinate the UTC transport plan. General: Provide or procure legal advice on matters relating to copyright, contract or charity law ensuring compliance. Act as Data Protection Co-ordinator and respond to any Data Protection access of Freedom of Information requests. Ensure the UTC s Disaster Recovery Policy is known and fully up to date. Participate in the life of the UTC community including representing the UTC at performances, events and functions in the capacity as a member of SLT. JOB DESCRIPTION: CENTRE MANAGER, ELECTRIC WORKS. To organise the day- to- day running of the Library, learning resources and Library study areas.